This is the first of many posts I will be writing for Office Depot and SmallBizClub.com! I am very excited to share some insight into the social, digital and tech world over the next year. I really want to dive into what trends I see in marketing and how to continue to properly tell your story in a noisy, social and quickly changing world. I am 100% focused on delivering real value and ideas that you can implement in your own business. In this first post, I analyzed a few small businesses and the content they are posting on social networks. Please comment and let me know what you think! 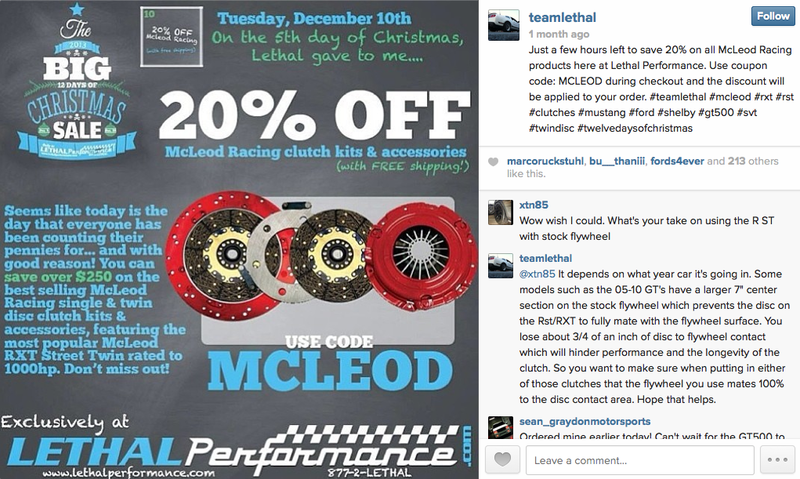 The guys over at Lethal Performance are doing a pretty great job on Instagram. Their jabs are perfect for the platform, giving viewers what they want, and looking good doing it. The problem here is that they’re not acting on their own results. Due to certain limitations (e.g., not allowing hyperlinks in image descriptions), Instagram really is best suited to be a platform almost exclusively for Jabs. If you’re going to Right Hook and go in for the ask, you can’t do it without presenting a clear path to purchase, and you just can’t do that without a link. So then why, Lethal Performance buddies, are you posting stuff like the image above? First off, the creative honestly looks more suited to a quarter-page ad in a local newspaper than whizzing by on your phone’s Instagram feed at the speed of the stream. There is way too much text there to make a clear impression on a consumer in time to catch them and keep them engaged. Then, coming back to my original point, let’s say someone sees this and does want to buy. What then? There is no link for them to do so. Now if you wanted to get a little fancy, you could do something like saying “Link in my bio” and then place the product link in the only place on Instagram that allows outgoing links, the account bio, but that’s not an approach that works in all situations. 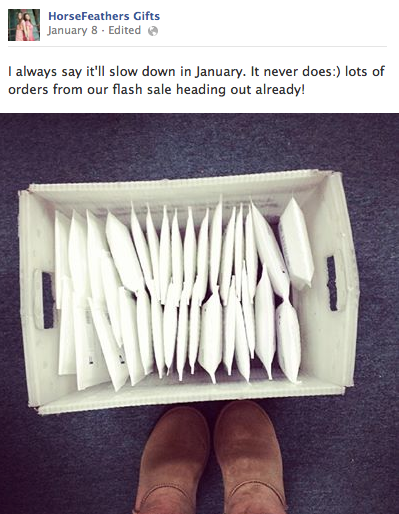 I can’t actually describe how much I love how Horsefeathers Gifts handles their Facebook account. Their feed basically acts as a laundry list of “Things every brand should be doing on Facebook.” The voice and the content both give you a clear idea of their personality, the creative is an almost perfect mix of product shots, quotes, and candid photos, and the Right Hooks are short, have clear CTAs and even contain things like coupon codes. I can’t stress this enough. If you run a small retail operation, and you’re not quite sure what the right move is, bookmark this page and refer to it for inspiration. It’s that good. Remember how I said that you should bookmark Horsefeathers Gifts as a reference for Facebook inspiration? 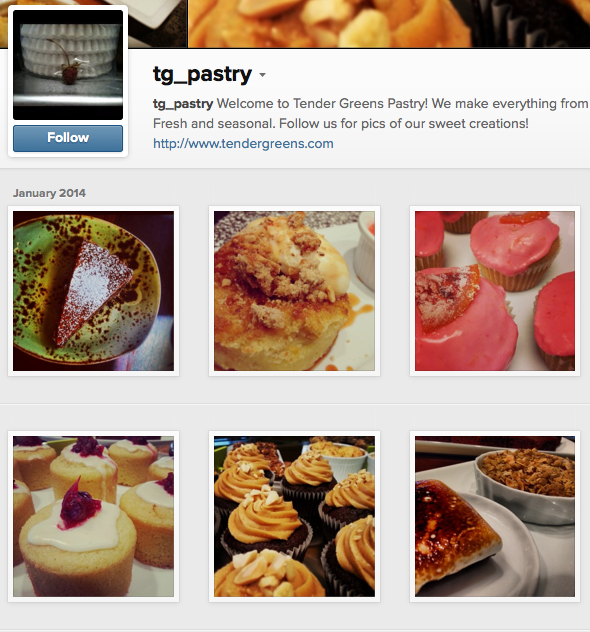 Well, the same goes for Tender Green’s Instagram account. These photos are absolutely insane. It’s not likely that a business of this size can afford a professional food photographer, so tons of kudos to whomever is taking these shots. To be honest, I’m kind of shocked that they have as few fans as they do, but that may have to do with the way they’re handling their hashtags. Hashtags are the most powerful discovery tool that Instagrammers have at their disposal, but there are still so many users who look at it as a way to try and establish their branding. Using #tendergreens might be a nice thing to train your users to do when they’re happily Instagramming the food they’ve ordered, but it’s not going to get you many new users. Instead, you should be looking at the obnoxiously huge world of food-related hashtags and using TONS of them on each post, in order to maximize the number of feeds your shot shows up in. With that in mind, I want you all to check out www.statigram.com and search for a few terms that are related to your field. In this case we can go with “#instafood” and immediately see dozens of related hashtags across millions of photos. Find some you like and add them as a comment to a few of your photos. More people using the hashtag = more people clicking the hashtag = more people potentially seeing your photo. 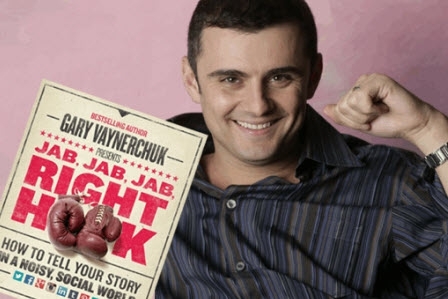 Bestselling author and entrepreneur Gary Vaynerchuk began his career in his family’s business, Shopper’s Discount Liquors. He soon rebranded the store as Wine Library, launching a retail website and boosting its revenue from $4 million to $60 million. In 2006, Vaynerchuk launched Wine Library TV, a daily video blog about wine. With the tagline “changing the wine world,” the show offers an unpretentious approach to a historically stuffy subject. As the audience grew and word spread of his informal and unorthodox approach to wine, Gary made numerous national television appearanches and landed a book deal. Follow @GaryVee on Twitter.